Although popularly known as the Sherborne Cartulary, this manuscripts contains much more than just copies of charters relating to Sherborne. Of about 90 leaves, the last 50 or so contain mainly liturgical and biblical texts such as the accounts of the Passion from each of the Four Gospels, and Gospel readings and prayers to be said on major Church feast-days. The contents of the cartulary section, however, leave no doubt that the manuscript was written for Sherborne Abbey, in Dorset. 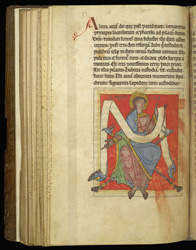 Following the end of St. Matthew's account of Christ's Passion, and before the start of St. Mark's account, is a half-page space which has been filled with a miniature of Mark, seated on a folding stool. He hold a blank scroll, which was probably intended to have an inscription.